20 to 25 year warranty. We have access to a variety of high power modules from the world leading manufacturers. 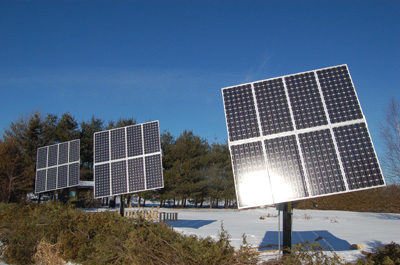 Custom designed PV systems are available for both off and on the grid applications. Ontario now has Net metering for renewables. Whether you need a single module for a remote camp or commercial installation you can count on over 32 years experience to get it done right. The two most common types of solar panels are Mono Crystal Silicon which offers improved performance in overcast weather and the Polycrystalline silicon that offers a lower cost with equal performance under full sun.